This is the first etch a sketch image I've ever drawn on a pre-preserved etch a sketch. It was a bit of a nerve-wracking experience to create. Since I could not erase, I was afraid I was going to mess up. But I am thrilled with how this turned out!!! I'd say this took about 3 or 4 hours to knock out. This is a completely original concept, and I had a lot of fun planning and executing this piece. I wanted to create something that was very intricate, and gave me room to experiment with multiple patterns. EDIT (06-14-15): This Etch A Sketch piece is now a featured design on my new business card! Damn girl! You are freaking amazing!! thanks! It's one of my personal favorites as well. Very cool! This one really caught my eye. Creative and whimsical. Haha, I just realized that I'm the third person in a row to say, "Very cool!" That is amazing. I do not have the patience to do that. Bravo. Like Xpresslife Tifa says, this reminds me of Keith Harring's work. He's one of my all time favorite artists, and his designs were so intriguing and animated. Excellent planning and execution on this. The textures are amazing, as are the figures' poses. And thank you for remembering the name of the artist! When I was younger I didn't get his work as much but now I am learning to appreciate it. No problem. I couldn't remember his name for the longest time until I looked it up one day. XD I've got his site bookmarked if you'd like a link. I was first exposed to Harring in an art appreciation class I took while working on my associate's degree. His work is so iconic, that it's impossible to not recognize when you see it. Lol thats awesome!!! Where do you get a pre-preserved etch a sketch though? That is absolutely incredible! Amazing work! That is legit! 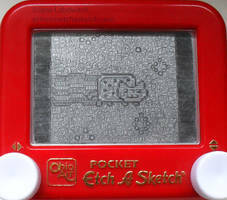 I have major respect for anyone who can use an etch-a-sketch like that! This is amazing! Your incredibly talented! I will never be able to accomplish such a feat on an etch a sketch. I refuse. I removed the powder from the inside of the etch a sketch, so since the powder is gone, it no longer can be erased. I also glued the knobs onto the unit so that nobody can turn them anymore. Cool, that is awesome, i think you have very unique and amazing talent! How would you ship something like etch-a-sketch art without it getting ruined during transit? Well I removed the powder from the inside of the etch a sketch, so since the powder is gone, it no longer can be erased. I also glued the knobs onto the unit so that nobody can turn them anymore. This is totally AMAZING! All I can do on an etch a sketch is make boxes! You never stop to amaze. También puedo hablar español un poco...he tomado 5 años en colegio. xDDD muy bien escrito, si señora. Eres una genio del etch a sketch o pizarra magica in spanish. And by the way, your spanish is very good, not many people wants to learn spanish. This reminds me of an artist that does the outline of the people but I don't know their name. ugh. I really love the different levels of buildings. The pattern worked out really well. Yeah I can't think of the name for the life of me. How much would it cost me to get a commission from you? I was thinking I would like a drawing done on etch-a-sketch. Or maybe we could do an art trade. Another deviant that commented on this piece thought of the name! Well what size etch a sketch are you interested in having me do a drawing? Depending on size/difficulty/detail of subject matter, I can figure out a price from there.